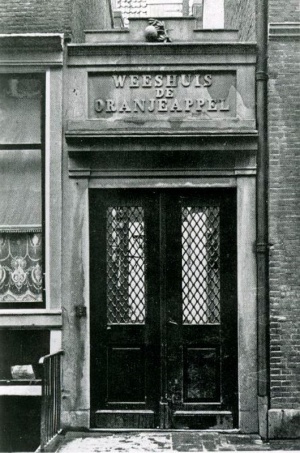 De Oranjeappel (The Orange), is the name of a Dutch orphanage, founded in Amsterdam in 1675. The founders were Collegiants, most of them being at the same time members of the Mennonite Lamist congregation at Amsterdam. The first governors of the orphanage, Anthony Rooleeuw, Willem Bruin, Adriaan Pieters Dekker, Gerrit Jacobsz Derramout, and Pieter Rijndertsz, were all Mennonites, except Derramout. Until 1920 the orphanage was located on the Keizersgracht in Amsterdam; in this year a building was acquired at the De Lairessestraat. In 1930 the orphanage was moved to Hilversum. Until the end of the 18th century the orphanage was purely Collegiant, but in 1811 an agreement was made between the governors of the Oranjeappel and the deacons of the Amsterdam Mennonite congregation. Henceforth, the foundation of the Oranjeappel remaining independent, two of the four governors were to be nominated by the Amsterdam Mennonite church board, and all governors were to be members of the Amsterdam Mennonite congregation. After this agreement was made the Mennonite orphanage of Amsterdam was closed and its 17 orphans were taken into the Oranjeappel. Loosjes, Adriaan. Het weeshuis der Collegianten, "De Oranjeappel" 1675-1925. [Hilversum]: Weeshuis "De Oranjeappel," 1925. Zijpp, Nanne van der. "Oranjeappel, De (Amsterdam, Netherlands)." Global Anabaptist Mennonite Encyclopedia Online. 1959. Web. 22 Apr 2019. http://gameo.org/index.php?title=Oranjeappel,_De_(Amsterdam,_Netherlands)&oldid=109170. Zijpp, Nanne van der. (1959). Oranjeappel, De (Amsterdam, Netherlands). Global Anabaptist Mennonite Encyclopedia Online. Retrieved 22 April 2019, from http://gameo.org/index.php?title=Oranjeappel,_De_(Amsterdam,_Netherlands)&oldid=109170.